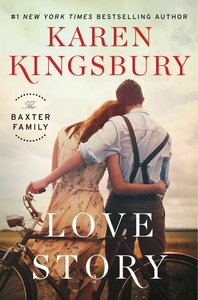 From #1 New York Times bestselling author Karen Kingsbury comes a new romantic story featuring everyone's favorite family-the Baxters-which tells the story of how John and Elizabeth first fell in love. So when John Baxter is asked to relive his long-ago love story with Elizabeth for his grandson Cole's heritage project, he's not sure he can do it. The sadness might simply be too great. But he agrees and allows his heart and soul to go places they haven't gone in decades. Back to the breathless first moments, but also to the secret heartbreak that brought John and Elizabeth together. At the same time, Baxter family friend Cody Coleman is working through the breakup of his complicated relationship with Andi Ellison. He is determined to move on when a chance sighting changes his plans-and heart. Can Cody convince Andi to give their love another try, or is it time for them to say goodbye for good? Whether you're meeting the Baxter family for the first time or finding them all over again, Love Story will stir your heart and remind you of the generational impact of love and the eternal bond of family. About "Love Story (Baxter Family Series)"